Fix bug turnoff progress bar! Fix bug: Black images when click "Save and Close" instead of "Save"
- Fix Bug: If there is a link (anchor tag) in image's description. It's text will be concatenated to thumbnail title. - Fixed: Duplicated images if user get images from same source after save module. 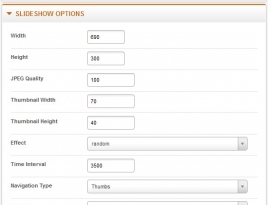 - Fixed: Effect Speed isn't configurable on Style 2.
and save up to $20 per extension! 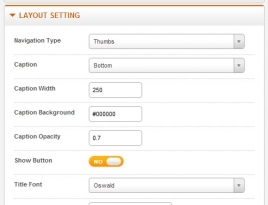 This extension is fully responsive on smartphones, tablets, and desktops. 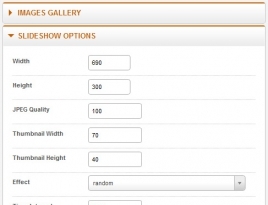 It’s easy to upload, preview image and arrange their orders before publishing them. 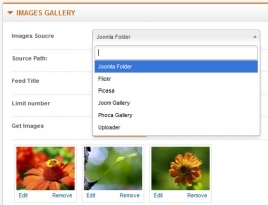 You can get images from various sources for slideshows such as Flickr album, Picasa Album, Joomla Folder, Phoca Gallery Component, JoomGallery component. Multiple files are uploaded (Firefox, Chrome and Safari only) by normal way or drag and drop. Editing photo is convenient because this component automatically crop and resize images and thumbnails when uploading them. You can upload unlimited images for slideshows. There are 6 styles for flexible image display options, 4 navigation styles (dotted, numbers, thumbnail and nothing) and 30 animation styles to effectively improve the beauty of slideshow. 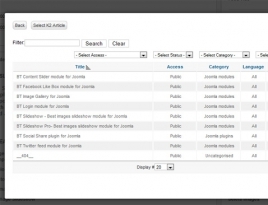 The extension supports blog components including Joomla! Articles and K2 component (getting title, description, link from Joomla articles and K2 items support). 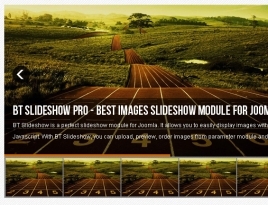 BT Slideshow Pro notifies detail uploading errors. Selecting color and font for title, description...is very flexible. 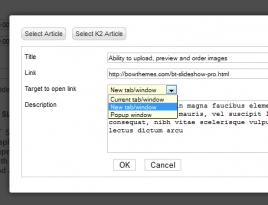 Also you easily insert images links, captions and descriptions for background slideshows. You freely hide/show button in control options. IE8+, Firefox 10+, Safari 3+, Chrome 8+, Opera 9+, Camino, Flock 0.7+. This extension came with the detailed pdf manual, video tutorials and great support. 1. What is the benefits of Bowthemes single product license? That gives you permission to install Bowthemes purchased product on one licensed domain and get our after-sales support. 2. What can I download when I purchased a single product? 3. Where can I find product’s price? The single product’s price is shown below the product’s thumbnail in Template/Extensions Showcase. 4. How long can I be supported by Bowthemes team? 5. What is the response time of customer support? If you buy single product, you can post your question in our forum and it will be replied within 32 hours of working days. 6. Can I get a discount for the second time of buying product? Sorry, we don’t have discount policy for single product buyer. If you want to buy more than one of our products, why not take a look at our membership packages? You will find it more economical. 7. Should I buy a single product or membership package? When you buy a single license, you will be authorized to install one product to one licensed domain. But when you buy a paid membership package, you can install full range of Bowthemes templates/ extensions on three or more domains. When you can access all our available templates, you have more choice because you can download many templates and extensions related. Each months in the membership valid period, we will send you our new product’s download link via email. And since your needs are different, you get a chance to create more website from our products. A paid membership package also gives you the optionsto get fast and express support from us. And yes, one customer can also purchase more than one product at a time, which means the validate period of membership package will be extended. Yes, Paid membership package is better! 8. Could I download all BT commercial extensions related to the template that I buy? Of course, yes. We always encourage our customers to use BT Extensions in their website. However, you are unauthorized to download upgraded version or install these extensions on templates of other providers as this features only available in J!Extensions membership package. You are violating copyright if you don’t respect this policy and we will give no support for these extensions. Users found in repeated violation will have their account deactivated.